One of the most fascinating group of plants growing in the Australian bush is mistletoe, and they are often found growing on native trees throughout the country. These plants are sometimes perceived as worthless parasites that weaken trees prior to their death. While this is partially true their value to our environment has been underestimated. 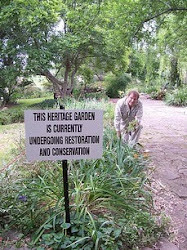 Recent research on these highly evolved native plants has led to a reappraisal of their importance to the ecosystem. Mistletoe's are a world-wide group of plants which are found in many different habitats. Most early settlers would have known the European Mistletoe (Viscum album), a commonly seen plant culturally associated with pagan fertility rights. Australia has 85 species of mistletoe, mostly from the Loranthaceae plant family. Most mistletoes are found growing on open forest and woodland trees such as eucalyptus, wattles and she-oaks. While most mistletoes photosynthesise from their own leaves they are usually dependent on the hosts sap for water and nutrients. Mistletoes are often seen growing on trees near the edge of woodland along roads or near cleared land. A 2004 study by ecologist David M Watson near Albury in New South Wales found that 80% of trees growing along habitat edges carried mistletoe compared with fewer than 5% in the interior.The reason for their preference for habitat edges was, according to Watson, related to increased light, decreased fire frequency, increased run off from roads and decreasing numbers of mistletoe eating animals such as possums and gliders at habitat edges. These environment factors have subsequently led to these plants being abundant on the edges of woodland. Many birds, animals and insects feed on the flowers, fruit and leaves of mistletoe. Birds birds found feeding on mistletoe include parrots, Eastern-Spinebills and of course the tiny Mistletoebird which feeds on the sticky fruit of the plant. The spreading of the sticky seed by the Mistletoebird is the principal way that new mistletoe plants grow on other host trees. These plants are also important food plants for bees, butterflies and Christmas beetles and are a popular nesting site. While doing research on several artists involved with the Bulletin I became aware that a small, but significant, number of their illustrations had garden related themes. 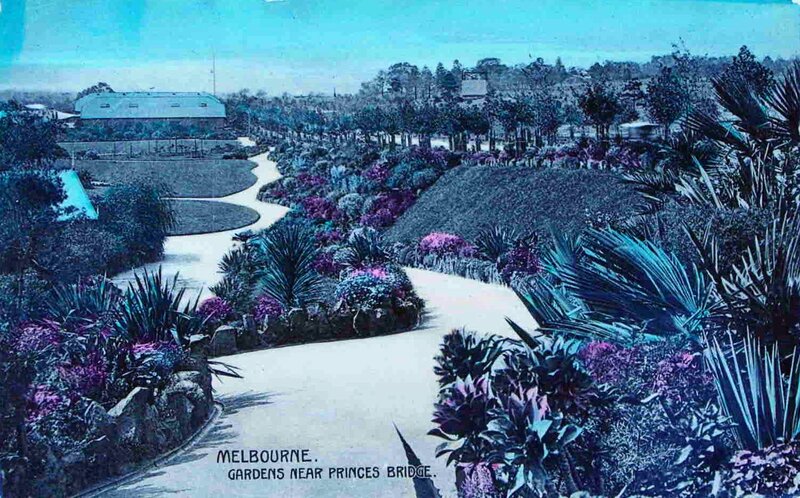 Later, I decided to explore some of these cartoons in an attempt to discover how gardens were perceived by Australian cartoonists, a group who like to be known as ‘black and white artists’. "I can't get him out of the house since he took up gardening." The Bulletin was one of Australia’s longest running publications and was in print from 1880 until 2008. During its early years the paper was proudly radical, racist, chauvinistic, nationalistic and republican. Its readership was diverse and the paper was extremely popular in rural areas where it became known as the ‘bushman’s bible’. From the early years of the 20th century the Bulletin became increasingly conservative and slowly moved its editorial gaze away from rural subjects towards the suburban values of the growing cities. 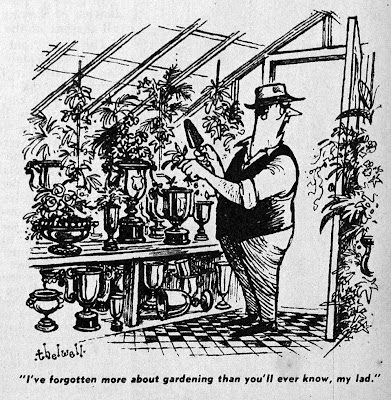 In cartoon terms this meant an increasing focus on humour related to middle class leisure activities such as golf, motoring, shopping, dining, and of course, gardening. 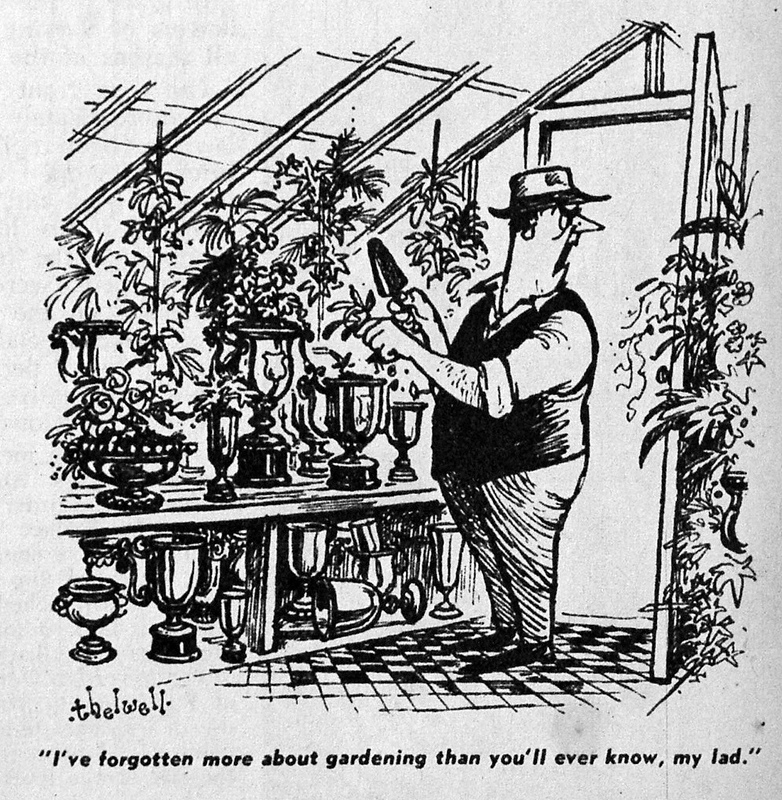 Garden related cartoons were mostly seen in the paper from the end of the First World War up to the time the paper changed ownership to Sir Frank Packer in 1961. 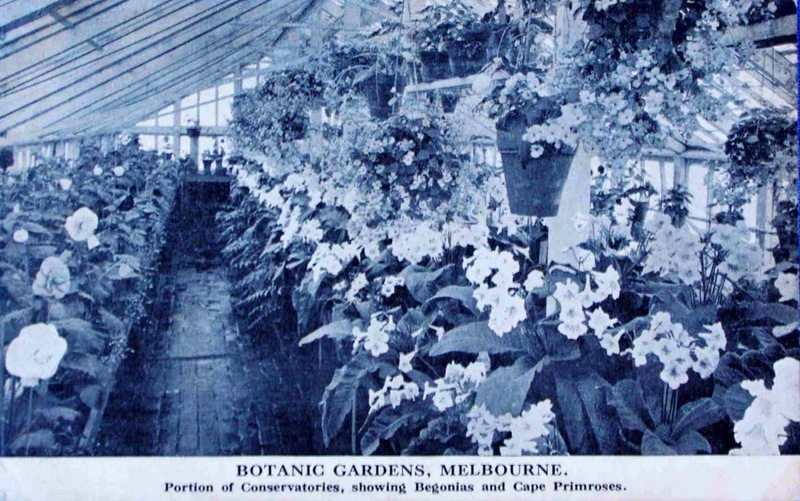 It can be no coincidence that this four decade period was also the time when the popularity of home gardening as a leisure pursuit was arguably at its peak. A dominant theme in garden related cartoons was the labour disputes between married couples. A typical cartoon would show the man of the house labouring in the garden (sweat invariably pouring from his head) while his bossy wife would scornfully direct works from the comfort of the veranda. This sort of image would have appealed to the mainly male target audience of the weekly. 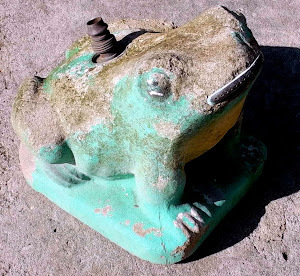 Other popular subjects include the ignorance of new gardeners, adapting to technological change in the garden, conflict between owners and their garden staff, and the public’s interaction with statues in our public parks. Another surprising subject was the antipathy to the growing of cactus and succulents which followed the infestation of prickly pear around the country. Ideas for jokes often came from Bulletin readers themselves, who would receive a small fee if their idea was used. Contributing artists were then commissioned by the paper’s art director. No Bulletin artists stand out as preferring to work with garden related subjects although the many images of Juan Endean and Percy Lindsay are noteworthy. 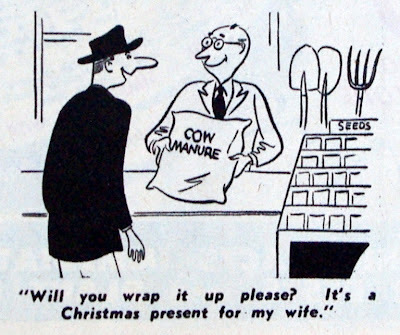 The Bulletin was not the only publication to include such comic images. 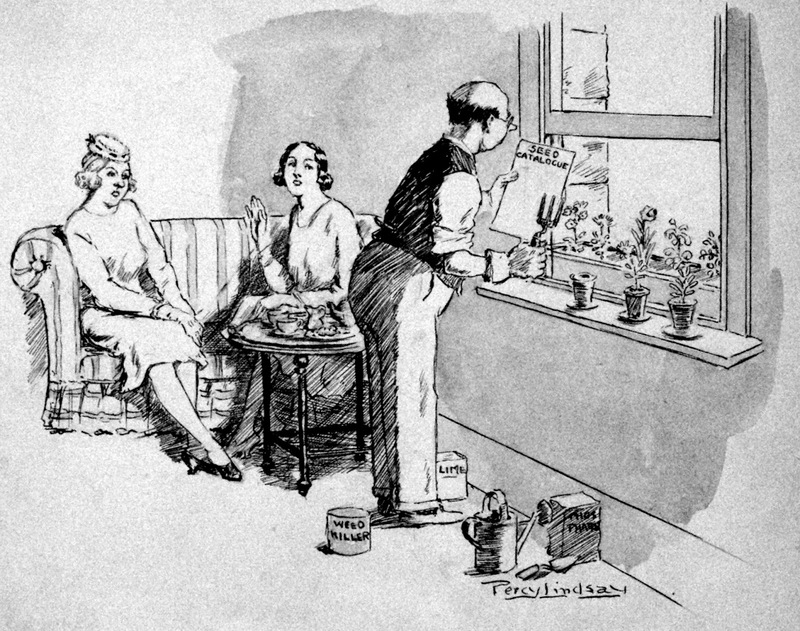 Other periodicals included them and the specialist gardening press occasionally included garden cartoons, although many were sourced from popular overseas artists such as Norman Thelwell whose work was often reproduced in Your Garden. By the late 1970s jocular cartoon images of gardens disappeared from the printed page. Hopefully the tide of garden ‘good taste’ will turn and like the increasing respect given to political cartooning we will see a return to seeing comic imagery in our gardening periodicals. 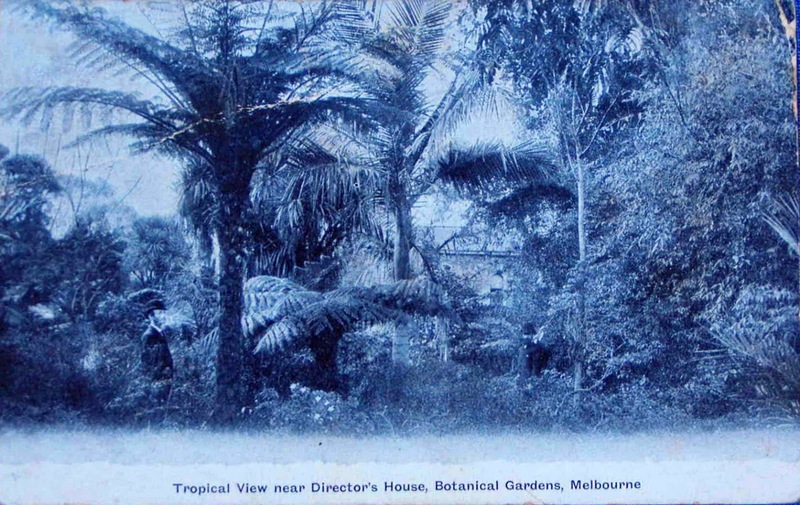 An updated version of this article was published in the October-December 2012 issue of Australian Garden History, the journal of the Australian Garden History Society. This article includes different images to the ones shown above. William Cobbett, English writer, democrat, and North American emigrant of the late eighteenth and early nineteenth centuries, was vitally concerned with gardening as it affected the agricultural classes. His books and opinions were known in early colonial Australia yet it is intriguing that he is rarely mentioned in modern historical accounts and his influence in Australia is yet to be fully documented. The son of a publican and small-scale farmer, William Cobbett (1763-1835) grew up in the English market town of Farnham during the years of the American Wars of Independence. His father was a rare local supporter of the American Revolution and from him William seems to have inherited his love for dissident opinion and unpopular causes. Cobbett’s interest for ornamental gardening began while working as a garden boy at Farnham Castle. A visiting gardener told him about the impressive royal gardens at Kew. He immediately decided to see them for himself, so the next morning he walked thirty miles to Richmond, and persuaded a Kew gardener to give him a job in the King’s garden. Cobbett only briefly worked at Kew before returning home to work in the fields and gardens of his home county of Surrey. Eager to experience the world, Cobbett moved to London in 1783 and secured a clerical position in a legal firm. He soon bored of clerking and the filth of London, and joined His Majesty’s 54th Regiment of Foot and was soon dispatched overseas. Cobbett arrived in Canada in 1785, and was involved in the border disputes with the infant United States of America. Cobbett spent seven years in Canada and rose up the ranks to become a regimental sergeant major. He returned to England in 1791 and promptly left the army. Back home he publicly campaigned against the financial and physical abuses in the army, and soon made important enemies. When threatened with libel and physical assault, he escaped with his family to France. After six months in revolutionary France, he fled in 1792 to the United States and made his home in the capital, Philadelphia. He quickly established himself as a teacher of English to French émigrés and also became a journalist and writer of political pamphlets, often writing under the pen name ‘Peter Porcupine’. During this period, Cobbett became increasingly fascinated with gardening and took great interest in horticultural developments in the infant republic. He was subsequently sued for libel and decided to return to his homeland. Back in England, Cobbett continued his writing career and established the Political Register newspaper, which soon became the largest selling paper in the country. Being the weekly paper’s principal writer Cobbett kept a close eye on what was happening in national politics, but he was increasingly troubled in how England had changed since the Napoleonic Wars and the arrival of the industrial revolution. His developing thoughts saw the Political Register move away from populist conservatism to become the most radical newspaper printed in Britain. 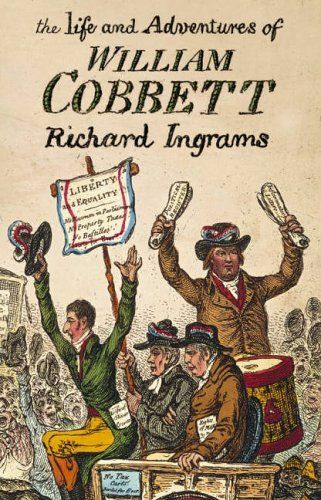 Cobbett – the democrat - also established a published account of debates in Parliament titled, Cobbett’s Parliamentary Debates. Several years later, after bankruptcy, Cobbett sold this pioneering publishing title to his printer, a Mr Hansard. In 1817 Cobbett again fled to the United States. This time his home was Long Island near New York where he set himself up as a farmer. While living in Long Island he wrote The American Gardener (1821) one of the pioneering books on horticulture published in the United States. After living in North America (in total) for seventeen years, Cobbett returned to England. 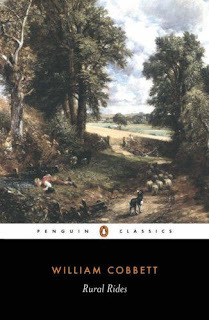 From 1821to 1826 Cobbett began his famous horseback tours of the English countryside. Cobbett’s lively accounts of these journeys were popular with his readers and were later published in Rural Rides (1830). The author’s frank realist writing style, in this classic work of English literature, certainly offers a counter view to the romantic images being created by contemporary writers and artists such as Wordsworth, Austin and Constable. While writing Rural Rides, Cobbett also published The Woodlands (1825), a book on silviculture that reflected his interest in trees. After his return to England in 1820 Cobbett established a plant nursery at Kensington where he grew many North American trees, such as the false acacia (Robinia pseudoacacia). Another American species he successfully promoted was a variety of maize which he modestly called ‘Cobbett’s Corn’. Cobbett believed that maize was a wonder crop that had the potential to transform English agriculture. The problem was that Indian Corn (as it was then known) was frost sensitive, and with only a few months of guaranteed frost-free weather in England there was insufficient time for the maize cobs to mature. Cobbett’s son discovered a dwarf strain of maize growing in a French cottage garden and obtained some seed. Trials back in England found that it grew well through England’s shorter summer. To help sell this variety Cobbett published a book titled A Treatise on Cobbett’s Corn (1828), which as a gimmick he printed on paper made from maize fibre. The English Gardener was a best seller and went through many editions up to 1860. 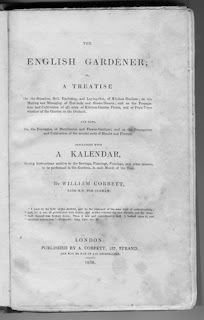 For modern readers, the most entertaining parts of this book are Cobbett’s condemnations of certain crops such as purslane, which he describes as a ‘mischievous weed, eaten by Frenchmen and pigs when they can get nothing else.’ But by far his most despised plant was the potato, a plant introduction which Cobbett felt was indicative of the sad decline in the agricultural lands. He felt that the rural poor’s dependence on this crop, would lead to calamity. Several years after his death, he was partially proven right, with the mass deaths in Ireland which followed the spread of the potato blight. Cobbett defined the health of the rural poor by a simple test. Happiness for a rural worker was defined by access to the three B’s – bacon, bread and beer. To Cobbett these were the three clear measures of agricultural happiness. This homespun belief may explain why Cobbett wrote Cottage Economy (1822), his best selling book during his lifetime. In this cheaply priced volume, Cobbett taught the cottager some of the skills needed to be self sufficient, including instructions on how to make bread, brew beer, keep livestock and how to weave hats out of grasses. It is highly likely that copies of this humble work accompanied many migrants bound for the English speaking colonies. Cobbett’s influence in Australia is less known. Cobbett never visited Australia and made little mention of Australian plants and gardening in his many publications. But the Australian colonies were starved of skilled gardeners so it is understandable that there was a need for gardening advice. 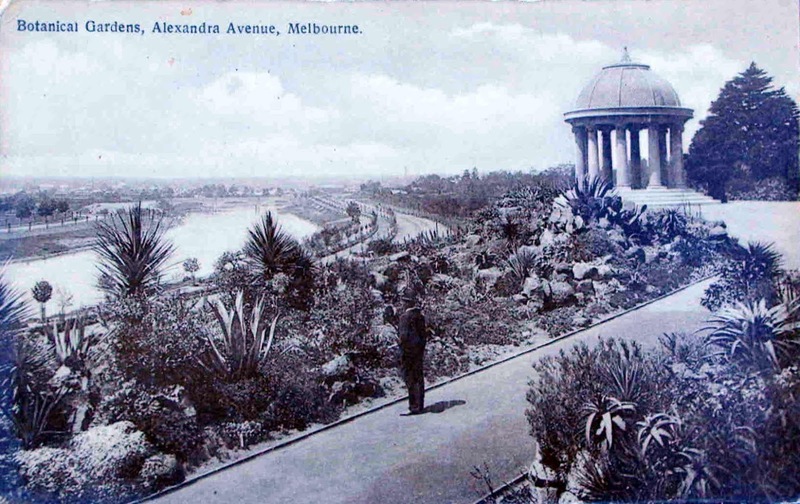 One of the earliest local works to provide gardening guidance was the Australian Pocket Almanack of 1825. This volume included a long extract on Cobbett’s views on successful hedge making, which had originally been published in Cobbett’s American Gardener. Apart from republished extracts, Cobbett’s garden themed books were certainly being imported into the colony during the 1820s and 30s, and possibly well into the middle years of the century. Sydney bookseller James Tegg was advertising Cobbett’s, English Gardener in the Sydney Herald in February 1837, several years after the Cobbett’s death. 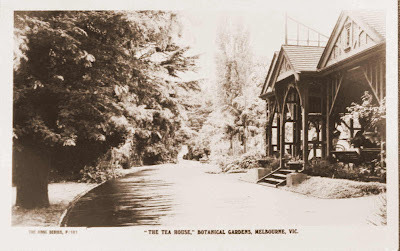 It is hard to say how much influence Cobbett had on early Australian gardens but looking at artistic images of productive gardens created in the early decades of the nineteenth century, many are similar to the small holdings known by Cobbett in England and North America. Gardening in the early years of the Australian colonies was mainly about survival and self efficiency rather than ornamentation, so it is logical that the writings of William Cobbett, which promoted self sufficiency for rich and poor, would have appealed to many local settlers. 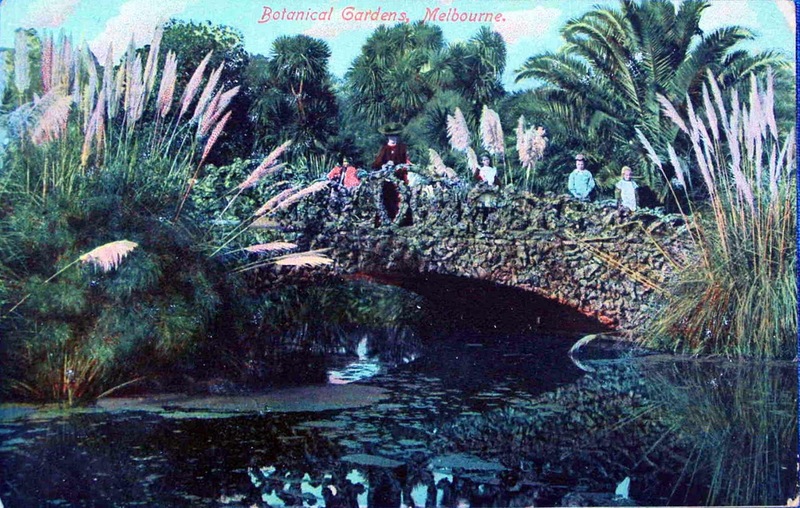 This posting was first published in the May 2008 issue of Australian Garden History and is based on a lecture I gave at the Royal Botanic Gardens, Sydney, in 2006. However experienced you are at composting you will sometimes have problems. Smelly compost is usually a symptom of an anaerobic mix, probable caused by not enough air getting inside the pile. This often happens when you have too much of one kind of ingredient - such as leaves or cut grass - or may indicate lack of turning of the heap. To solve the problem you need to demolish your smelly heap. Before you rebuild the pile, it’s best to improve access of air and water to the heap. One excellent way of doing this is by making a compost chimney. To make this you buy – or recycle - a plastic down-pipe which you cut to a little larger than the height of your heap. Score large holes with an electric drill at regular distance along the pipe – every 10cm is ideal – and place at the centre of the new heap. Holding the pipe upright with one hand, slowly rebuild the heap making sure that the green material is well mixed. If the old pile was too wet add some dry materials such as Lucerne hay or shredded paper. When the heap is rebuilt continue as you would for a new compost pile. The compost chimney should stand proud of the pile and will allow air and water to get to the centre of the heap. By sticking the hose into the top of the chimney will allow water to get to the core of the pile. This idea has become very popular with home gardeners in recent years and makes better and faster compost with little expense. While one compost chimney is sufficient for a small moulded compost bin, two or three will be more efficient in larger heaps. While it’s hard to deter foraging rats and mice, it can become a real problem when they decide to nest in your heap. Rodents living in the bin indicate that you have provided not only a reliable food source but a well drained warm home. The best way of getting rid of these creatures is by regularly working the heap with a garden fork and applying human urine to deter them. Rodents love cereals, so their presence can indicate that you – or someone else in your home – are putting bread and other cereals in the compost bin. The most common pests associated with compost heaps are flies. You have to put up with some flying insects being near your heap as they are attracted to this nutrient rich environment. One way to reduce the problem is to keep your pile covered. For the smaller bins use an old hessian or plastic sack over the heap and close the plastic lid. For larger heaps it’s best to cover the heap with a piece of large weighted down plastic. This will deter flies, warm the heap and protect the pile from excess rain. Composting is a natural process, where organic matter breaks down to create humus. In nature this happens all the time when green plant matter dies or falls from trees or shrubs, but since the middle of the last century we humans have began to understand the process of decomposition and the importance of organic matter in the soil. With rapidly reducing rainfalls, caused by climate change, compost has been found to be invaluable as it retains moisture in the soil and acts as a buffer against extreme environmental conditions. While you can be extremely technical about making compost, the non-scientist should approach the process as if they were a cook trying to make a cake. For a successful end result – be it a cake or garden compost - you need the right ingredients in the appropriate quantities as well as sufficient water, adequate air and the appropriate length of ‘cooking’. While anything that once lived can be composted its best to stick with reliable ingredients such as grass clippings, kitchen scraps, leafy garden pruning’s, shredded paper, fallen leaves and even old potting soil. The value of your compost relates to the quality of the ingredients, the position and size of the compost heap, the ambient temperature and the amount of time you spend turning the pile. For those with large gardens composting can be done on a big scale. The popular choice is to have three compost bays – or bins -placed next to each other. The bins are usually made of hard wood (ideally non-cyanide treated) and are exposed to the earth at the base below. In the first bay you place all your fresh green matter – grass clippings, garden pruning’s, fallen leaves, kitchen scraps, shredded paper and added water. After this has been in the heap for a couple of weeks it can be turned into the next bin. The process of turning the pile mixes the ingredients and introduces air to the centre of the heap. At this stage, check to see if the mix has sufficient moisture, too dry and the compost will take ages to break down, too wet and it will become smelly. With the right mix of ingredients, as well as air and water, the heap should become hot and ‘steamy’. If this is not happening the mix requires more air and more, or less, water and perhaps some poultry droppings or manure to give it a kick-start. After a couple more weeks ‘cooking’ the second bin can be turned into the third bay. Again check moisture levels at time of turning and make sure all the heap has turned to a brown colour. Depending on how warm or cold the weather is, the compost should be ready to use in a couple of weeks. The principals of composting are roughly the same for small gardens as they are for large ones. The main difference is that you are unlikely to create enough green waste to fill three bins and even if you did you wouldn’t have the room to place them in the garden. However much you like composting, these bins are not what you want to see, especially in a small garden. Also they are best hidden away from direct summer sunlight as too much heat can kill beneficial worms, insects and bacteria. The best solution for small gardens is to have two small size plastic compost bins. In the first bin put in your green waste; as you haven’t the mass of a large bin it’s very important that you make sure the green waste mix is varied and that moisture levels are just right. The ideal mix for a small bin are mixed layers of kitchen scraps, shredded paper, coffee grounds, grass clippings, cut up green garden pruning’s, and even human organic matter such as hair and urine (potty pee is fantastic in compost and around citrus trees). Avoid bread, citrus, onions, meat, weeds and ‘number twos’. While all these products can be composted they can upset your bins fauna, attract vermin and possible introduce potentially poisonous diseases into your garden soil. For those who want to explore ways to compost animal poo there are well designed compost pits (advertised in specialist garden magazines) suitable for this purpose. While not all organic materials are suitable for the small compost bin they don’t have to be chucked into the rubbish bin. In recent years most local authorities have provided a ‘green waste’ bin. This collected green waste is broken up and composted in huge scientifically controlled heaps which unlike home compost bins go to very high temperatures which kill all weed seeds and harmful bacteria. Some of these large heaps incorporate human waste (sourced from sewage plants) in the composting process. After processing, your council green waste is made into compost which is added to commercial potting mixes and other horticultural products. While we don’t get a direct financial return on the contents of this bin your community does. So when we quibble about what goes into our own garden compost systems we should make sure that kitchen waste such as citrus, egg shells, onions, pineapple tops and pumpkin seeds as well as garden weeds and twigs are not wasted by being thrown out in the rubbish bin, the correct place is the green waste bin. Many of us lead busy lives and we often have difficulty turning the compost heap. As regular churning is essential for a fine end result many gardeners have come up with cleaver ways to turn heaps without raising a sweat. The best way, especially for small compost heaps, is to add compost worms to the pile. Common garden worms are great recyclers but rarely venture into the warmer conditions of the compost heap. Compost worms (available from garden centres) are species which relish the warmer conditions inside the compost bin and will happily turn your green waste into humus. As they can’t live in the hottest phase of the composting process they have to have be able to escape to the earth when things get too hot. If the location of your heap avoids direct sun you will find that you can rely on your worms to do most of the turning and they will happily breed and multiply without becoming a pest. The turning barrel compost bin is another easy method. Looking like an oversized tombola barrel, this bin is a large drum mounted onto a metal frame. The gardener simply adds green waste and a little water to the barrel. After closing the small entrance door, the barrel is turned by using a simple to use handle a couple of times a day. This system can produce compost in a couple of weeks in summer. Despite the expense of buying the compost barrel and frame, this method is ideal for people who want compost but don’t want to exert too much energy. A far cheaper aid to turning conventional heaps is the compost screw. This tool is like an oversized corkscrew which you place in the middle of your compost heap. A slow turn of the handle gently incorporates the mix, bringing deeply buried green waste to the surface. Regular use of this screw-like-device along with added compost worms will reduce the need for turning your heap. Despite the occasional setback, compost making is a fun way to recycle your green waste. Using the compost heap in tandem with your local council supplied green waste bin, can dramatically reduce your environmental footprint and will improve soil fertility in your garden. Composting is not only a responsible thing to do it is also good exercise and mentally rewarding.